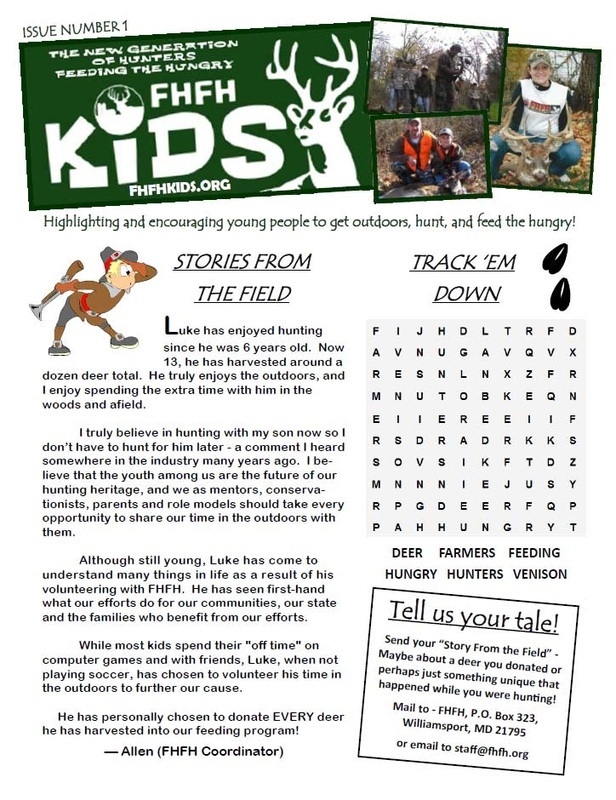 FHFH Kids - Farmers and Hunters Feeding the Hungry - Hunt Down Hunger! 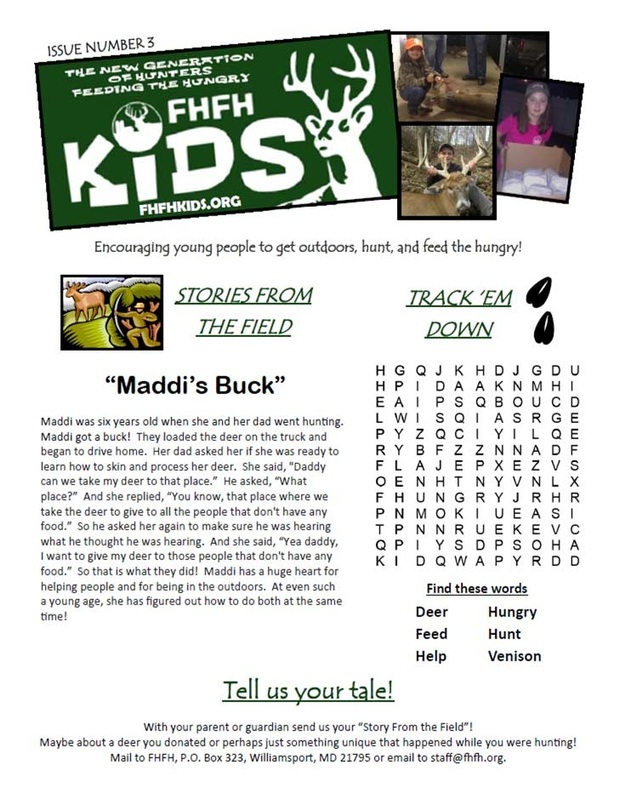 ﻿Young people nationwide are surprising their parents by deciding to donate their first deer to help feed the hungry! Feeding others - part of the heritage of hunting - is now being passed on to a new generation of hunters. 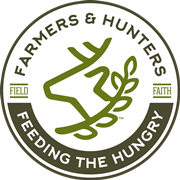 Together let's encourage this next generation of hunters feeding the hungry! It's wonderful when our children want to help others in need. These two eight-year-old children are wonderful examples of caring and sharing with others! We’re proud of you too Wyatt! And thank you for thinking of others and donating your deer to FHFH to feed the hungry! In this video, Emily shares her first harvest of a deer. She used her doe to feed her family at their Thanksgiving Day table. Emily is very proud to be a part of FHFH Kids! Emily says, "Hunting is and will always be my passion and I love it for not only being able to provide meat for my family, but being able to serve God with hunting. 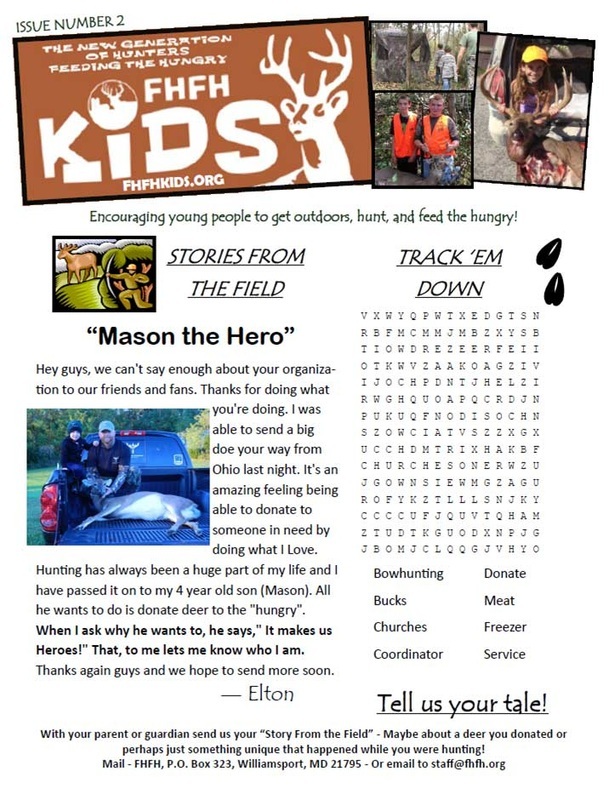 I always try to encourage youth to take action and help your community, and hunting and donating meat is one way to do so." This weekend I had the privilege to hunt with my 10 year old son Noah on a Youth Deer Hunt. Noah took his first deer ever a nice doe that gave him a good shot at 30 yards early Sunday morning. Noah has been praying and practicing in preparation for this opportunity. 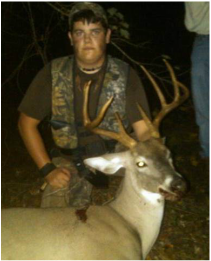 He has put a lot of time in the woods and has felt the frustration of missed opportunity and tough days afield. He was overjoyed yesterday morning when his shot hit its mark! After the initial rush of emotion had subsided I asked Noah what he wanted to do with his deer. His response...“Donate it to FHFH.” This was obvious to him and he looked at me as if puzzled that I would ask such a question. He is a boy with a true servant’s heart. Thank God and thank you Rick (Founder) for FHFH and for helping Noah learn the value of being a servant for Christ! I've tried to involve each of my three sons in local philanthropy. They know that we are serving with FHFH out of the goodness in our hearts, not for personal gain. My 18 year old son Jared really "gets it" and has been involved with our FHFH chapter for the past four years. He's also taken the next step, bringing in some of his hunting friends like Giles and Dalton to help by donating and volunteering. As a father, I take great pride in the fact that he understands the importance in getting protein-rich venison to our local needy. Luke has enjoyed hunting since he was 6 years old. Now 13, he has harvested around a dozen deer total. He truly enjoys the outdoors, and I enjoy spending the extra time with him in the woods and afield. I truly believe in hunting with my son not for him—a comment I heard somewhere in the industry many years ago. I believe that the youth among us are the future of our hunting heritage, and we as mentors, conservationists, parents and role models should take every opportunity to share our time in the outdoors with them. Although still young, Luke has come to understand many things in life as a result of his volunteering with FHFH. He has seen first-hand what our efforts do for our communities, our state and the families who benefit from our efforts. While most kids spend their "off time" on computer games and with friends, Luke, when not playing soccer, has chosen to volunteer his time in the outdoors to further our cause. He has personally chosen to donate EVERY deer he has harvested into our feeding program! Well Katlynn it is our second day to bow hunt together. We awaken and it is dark, cold, windy and rainy. We decide not to go. No more than the decision has been made to stay home and the rain stops. So we dress and head out. Zach and Rocky are heading to the north side of the creek and we go to the south side. We quietly make our way through the dark woods to the ravine and the ravine is filled with water. We cross at a different spot and head back towards the stand. Well at least I think I am headed for the stand! We look and look and cannot find the stand. What the heck?! I know the stand is here. Why can’t we see it? As we wonder around in the dark woods a deer blows four times. By this time I am frustrated and you are hot from wearing all the clothes I told you to pile on. You say, “Grandma can I sit down? I am hot.” So you sit down on the ground beside a log. As the sun begins to rise I continue to wander around and look for the stand. Now you are quietly saying, “Stop, Stop!” I look up and there is a doe heading towards you. The doe sees me and runs. So now I am almost in tears and apologize for ruining your hunt. As you console me you say “It’s ok grandma. You didn’t ruin anything.” I think to myself what a good little trooper! And...where in the world is that stand??? As I am digging in my pocket for my facemask and gloves, along comes another doe down the trail. It spots us. Looking at us curiously it comes down the trail. I am hugging the tree and trying not to breathe or blink in fear it will see movement. You slowly raise, you aim at the deer, and as she turns you shoot! I hear a thud and see the arrow land in the dirt. The deer turns and walks away. I say, “Well Katlynn a few seconds later with that shot and you would have had her!” You reply, “Grandma I hit that deer!” We walk over to the arrow and low and behold it is covered in blood! We call in the troops- Grandpa Rocky, Uncle Scott, Zach, and Dawson. We track the deer and find it in the bottom of the creek bed. Well Katlynn you are pretty proud of yourself and you wear a smile for days. You are excited about the jerky you are going to have. And I am so stinkin’ proud of you!! I am thankful for being able to spend time in the woods with my granddaughter and for you to experience your first harvest. Now you have your hopes up on getting a buck and I sure hope you get your wish! What a girls' day out! The newsletters are in pdf format and may be viewed or printed by clicking on the desired issue. National Wild Turkey Federation "Jakes"
Quality Deer Management Association "Rack Pack"